Achieves secondary pressure accuracy within ±0.01 MPa of the set level. 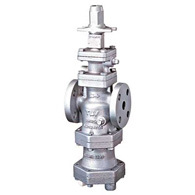 Even if the steam flow (load) to the equipment or the primary pressure at the pressure reducing valve changes, the Shock-Absorbing Spherical Piston (SAS) supplies steam at a constant pressure in order to prevent temperature fluctuation downstream. The built-in Cyclone Separator removes condensate from steam with a condensate separation efficiency of 98%. Condensate entrained in the steam is removed, and a strainer further removes any scale. 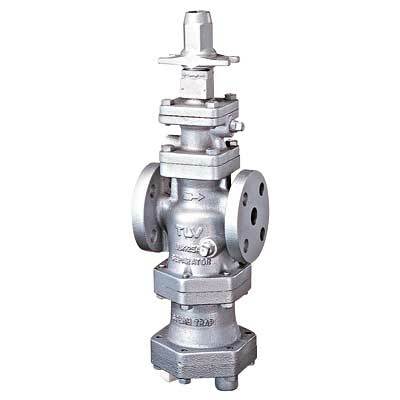 The condensate that is separated out is discharged through the built-in Free Float® steam trap. The increased quality of the steam contributes to improved heat conductivity. Pressure adjustment is simple; just use the cover cap as the adjustment spanner. Recommended for processes requiring steam at a stable pressure and processes such as atomizers in which steam comes into direct contact with the product. Reactor kettles, dryers, heat exchangers, presses, steamers, blowers, atomizers, etc.